Another great book in the series. This book was action wise a bit slower but was very character and story driven. But I must admit that even though it was slower on the action site I enjoyed this book a bit more. 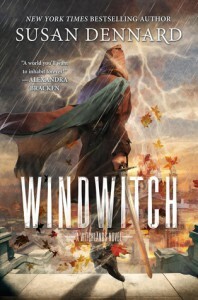 The book starts off a couple weeks where we ended with book one, it is called Windwitch and about Merik ,BUT we do get everyone else as well, just like in book one. We actually meet some new people, and also get a POV of people we heard about but not followed yet. Most of the group is split up and scattered throughout the world, some meet and team up and other make new allies. Some are surprising and I didn’t even think about. Others, not so much. The most notable apart were Safi and Iseult. Though I think they handled it better than I thought they would and they were still great, both in their own ways but still thinking of the other. We learn more about both Safi and Iseult but I say more so about Iseult and her threadwitchery, the history and much more. The same about Safi, but there is only so much we can learn about her magic, its pretty straight forward, though I’m still thinking we learn that there is more to it. Merik…. Oh boy he was down in the dumps in this book a times, which got him in trouble, but he pulled through and made it . We learn something really shocking and surprising about him towards the end which left me speechless. I liked Cam ….. I thought it was a great addition to the story. Can’t wait to learn more. We also get Vivia’s POV which I thought was very interesting and want so much more of it, the same goes for Caden…….I hope, we see more of him in the next books but at the same time I hope we are not getting a love triangle situation. Vaness I also liked but never fully trusted and am curious to see where it leads. Aeduan , he quickly became one of my favorites and I could not get enough if him, I also liked we get a few , very few glimpses of his humor. I also can’t wait to learn more about his father…..
Owl, came late in the book but I loved and can’t wait to see what that is all about . Overall, it was slower but still better than the first. As mentioned it was story and characters driven and since I love this crew so much I didn’t mind a bit.